The Shoulder Bolt allows you to quickly and easily convert your Hoss Double Wheel Hoe into a Single Wheel Hoe. 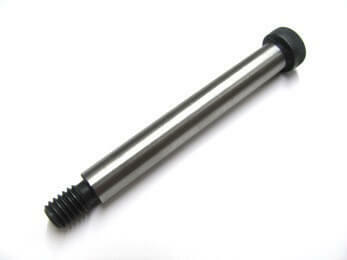 Shoulder Bolt has dimensions of 3/8″ x 2 3/4″. Easily and quickly change your Double Wheel Hoe into a Single Wheel Hoe with our Shoulder Bolt accessory. This bolt is the axle for the Single Wheel Hoe. Simply switch the arms that extend to the wheels, and install the smaller axle to convert into a Single Wheel Hoe. The Single Wheel Hoe has a smaller footprint than the Double Wheel Hoe, which allows you to work in a narrower row spacing situation. This smaller wheel track is important when cultivating and weeding winter crops such as lettuce, kale and collards.